At the end of my last post about ‘dangerising’, I mused about why, despite the presence of many pedestrians – and speeches from pedestrian campaigners – at the Die In last Friday, nobody appeared to voice any concern that people might be put off walking by talk of the deaths and serious injuries of pedestrians, unlike the concern expressed about people potentially being put off cycling. Of course part of this is due to the fact that the pedestrian aspect of the protest did not feature much in the news bulletins at the time; it just didn’t seem to get the same amount of coverage. It was a ‘cycling’ protest, as far as the superficial observer was concerned. Nevertheless, there were interviews with Tom Kearney and Nazan Fennell on BBC News, and the danger posed to pedestrians was a major element in the material and publicity surrounding the Die In. The list of people killed in recent years, read out by Living Streets campaigners, included both people walking and cycling at the time of their death. Now it would be quite odd, I think, to worry that protests about pedestrian safety are ‘dangerising’ walking, and making it seem like something unsafe; to worry that people might be put off walking to the shops because of protests like Die Ins. Indeed I noticed that Copenhagenize linked – apparently approvingly – to a splash about pedestrian death and danger in New York, barely 24 hours after he had criticised the Die In for putting people off cycling. The headline of the New York Post article is ‘Don’t Walk’, with the text reading ‘Looking both ways isn’t nearly enough when crossing Big Apple streets’. Pointing out the dangers posed to people walking in cities, it seems, does not require any angst about whether others might be discouraged from walking at all. The complete opposite is true of cycling, where every British campaign or protest that mentions danger is nearly always accompanied by nagging concerns and doubts about whether we are ‘putting people off’. This policy of avoiding the negative seems to have a long history in Britain. David Arditti remarked during a conversation with me on Monday that the Tour du Danger in 2011 was the first time in a long while that the risks and dangers associated with cycling were explicitly referenced in a campaign. Danger was, traditionally, something not to be mentioned. Ghost bikes should to be tidied away quickly in case people were put off – an idea that got me a bit annoyed before the Tour du Danger. Sunny optimism about how ‘you’re better off cycling than not cycling’ was the way forward, with the familiar tired story of how, despite the casualties and deaths being reported, you are statistically likely to live two years longer if you cycle. I think a decisive break has been made with that kind of approach, probably because of a recognition that it wasn’t getting us anywhere, and also a greater understanding of the reasons why people don’t cycle. Statistics about how safe cycling is, objectively, are not persuasive when you are faced with road environments that feel threatening and hostile. As I argued in my previous post, campaigning that focuses on danger is at worst merely repeating the way most people already feel about cycling – they don’t want to do it, but would do it if it felt and looked safer. This gets to the heart of why nobody is really concerned about pedestrian safety campaigns putting people off walking. Unlike cycling in Britain, walking is (with notable exceptions in rural areas) a subjectively safe activity. Pavements do go pretty much everywhere, from door to door, and your interactions with motor vehicles are carefully controlled. Indeed, it is in places where there aren’t pavements, particularly in rural areas, where walking can feel as unsafe as cycling, if not more so. This is not to say the pedestrians aren’t exposed to actual danger, both with and without pavements – the deaths and injuries documented recently demonstrate this – it’s just that walking is not an activity where you actually feel threatened by motor vehicles, in a way you do while cycling. You can walk along roads and streets that are incredibly unpleasant to cycle along in relative comfort, without concern for your own safety. People who get on bikes in traffic quickly realise they have no protection other than their own physical capabilities and wits. They discover that they are totally on their own. Nobody and nothing will protect them, not the Highway Code, not the police, not the Crown Prosecution Service, not the courts. And the roads are often designed to make things as dangerous as possible for them. This utterly uncontrolled, socially anomalous danger of cycling is what makes it unique as a legal activity. Being a pedestrian can sometimes have a similar character, but not for so long, as pedestrians are mostly segregated from traffic. Cycling, for a normal activity, that we would hope would be an everyday one, as opposed to a special one like mountaineering or skydiving, is tolerated by our society as uniquely dangerous. When we talk about the lack of subjective safety while cycling, what we are really driving at is that cycling does not feel as safe as walking in Britain. People will continue to walk even in the wake of hypothetical campaigns that highlight and focus on the dangers people walking face, because as a day-to-day activity, it does not seem dangerous. The concern about putting people off cycling stems from this discrepancy; we are implicitly acknowledging that cycling is something that is fragile, that can easily be discarded as people switch to other modes because it just isn’t very attractive or pleasant. Walking is, by contrast, a much more robust mode. One of the main functions of Dutch-style infrastructure is to address this issue. 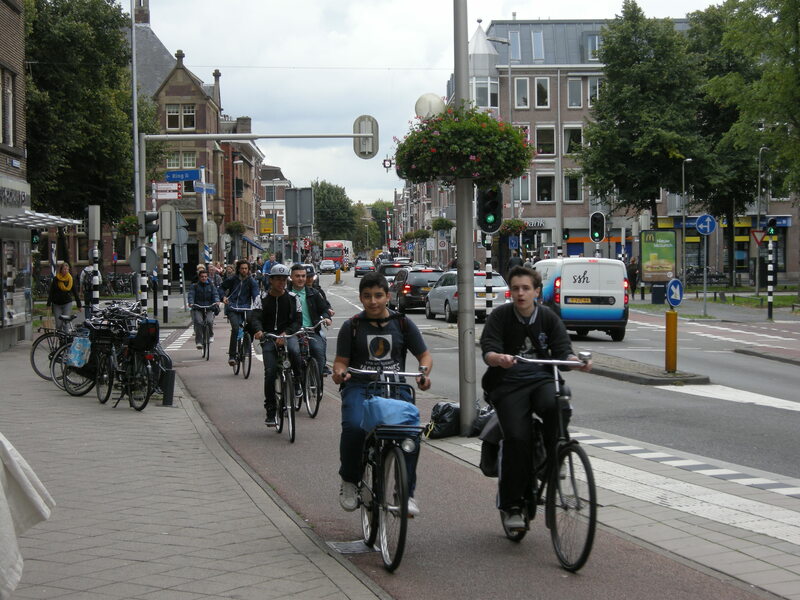 Cycling in the Netherlands feels as safe as walking does here, if not more so, because you are insulated from interactions with motor traffic in precisely the same way you are while walking on pavements. I think a useful test (but obviously not the only test) for whether you are providing a genuinely suitable cycling environment is to ask whether you would be willing to walk where you are expecting people to cycle. If the cycling environment corresponds to a walkable one, then you are enabling cycling for all. When cycling feels like walking. It is this difference between the way cycling and walking currently feel in Britain that explains why ‘dangerising’ is such a concern about the former mode of transport, but not for the latter. The difference suggests that talking about danger really isn’t the problem; it’s the physical environment, and the way people respond to it. This entry was posted in Infrastructure, London, Subjective safety, The Netherlands, Walking. Bookmark the permalink. This is of course why so many choose to cycle on the footway. @jitensha – I think pavement cycling happens as a result of the “risk assessment” that it’s safer for me to ride on the pavement as my degree of danger as a cyclist is massively lower. I think that’s what you’re saying anyway. The proportion of risk is subjectively much lower. This still shows the basic design is of conflict for cyclng. You’re either in conflict with motor traffic or pedestrians without dedicated space for bikes and there is plenty of room for all modes to have their own space – as long as you reallocate to more efficient modes. This is an interesting issue. Is it entirely true that nobody is put off walking because of the danger from motor traffic? When I used to go to school as a child in London I would usually get public transport there in the morning and walk back (on my own) afterwards. It seems to me that these days children are far more likely to be ferried back-and-forth in cars. Fear of traffic must surely be, even if not consciously, a factor in that? I also wonder, not being a country person myself, how people outside the cities feel about walking on narrow minor country roads, with their multiple blind bends and scarily fast traffic? This is an often overlooked problem, and I think a very serious one. You can have two villages close together, say half a mile apart. The through road is busy, fast and without lights or pavement. Hardly any adults dare walk or cycle on it. Few, if any, buses. The children of one village, who probably go to the same school as the others, are unable to visit their friends unless someone gives them a lift. You’re absolutely right, I have a friend in the highlands and when I pointed out some new cycle lanes approvingly he told me that the locals he knew were delighted – children hadn’t been able to walk to the local school for about 20 years. I feel it crossing the main road with my daughters to our primary even in our small town – there’s no formal crossing and cars speed at 40 in a 30. My older daughter’s friends are mostly the other side of the road, and she won’t be able to cross unaccompanied until she’s 12. It’s just not safe. I tried walking on the country roads near me (West Midlands) once during the summer – it was rather unpleasant thanks to motor traffic which, though not heavy, was high-speed, no footpaths beyond the edges of the village, and very narrow verges leaving me little option but to walk on the road. It’s not something I’m going to do again. There are public footpaths through the fields that have great views, so there is some scope for walking. These paths aren’t quite so accessible, however, and are usually much messier and require sturdier footwear than flipflops. In London I would often cover 8-10 miles on foot in an afternoon. I think its more complicated than simple fear of the busy road. Various governments over the last 30 years have forced this concept of “choice” into education and have thus destroyed the link between the local school and the homes of the kids attending it – many now often live several miles away from their school and will not necessarily live near routes directly accessible via public transport. Couple that with smaller schools in residential areas being consolidated into mega campuses on the edge of town (great access to the motorway! ), while the old grounds are sold off to developers. Add to that the fruits of the various moral panics over the years of “stranger danger” – recall the News of the World’s notorious “outing” of paedophiles about a decade ago. Paranoia rules, it seems, hence a generation of cotton-wool kids en-prisoned in their homes and their own obese bodies. Also, I suspect that the ‘danger’ in walking gets converted to ‘inconvenience’, and that does, in fact, have a subtle suppressive effect on the desire to walk. The time required to get across horribly busy roads, the irritation of having to squeeze past kerb-side fencing or parked cars on overly narrow pavements, must all get factored in when deciding whether to walk or take the car? As someone who walks a lot in London (and cycles a bit), I think the issue of traffic is not that it makes walking “dangerous” so much as it makes it unpleasant. So this morning I got off the tube early and walked the rest of the way to work. I didn’t take the shortest route as that would involve walking down the A41. Instead, I walk further to be able to walk across the park. Taking the longer route makes my walk “nicer” – quiet rather than traffic noise, fresh-ish air rather than fumes. Walking alongside a busy road doesn’t feel dangerous, but nor does it feel terribly nice. As the post makes clear, this is about the physical environment. If you build bike paths, more people would cycle as they would feel safer, even if there was not that much danger in the first place. If you built “walking highways” away from traffic, I’m sure people would walk more because it would feel nicer. In practice, the two are the same thing: it’s about restricting motor traffic in urban areas, and creating spaces for walkers and cyclists to use their chosen form of transport in a more optimal way. Walkers already have this to a certain extent in the form of pavements and parks – what’s missing is any attempt to link these in a way that encourages walking. You only get to walk somewhere nice as long as it doesn’t interfere with motor traffic. Cyclists have almost no help in this regard, and so the share of journeys remains painfully low. The differnce between being a pedestrian (in which I include wheelchair users) and riding a bike is that we have no option about the former if we want to be functioning members of society whereas most people can and do choose not to cycle and still lead normal lives. No matter how scary you make walking sound people will still have to do it to some degree. We can argue about just how “safe” cyling is but what is beyond question is that most people already overestimate the risk. This is why tone of the campaining has to be different, simple. I’m not sure I agree. While many walking trips are obviously unavoidable, just as many trips that are currently walked could be switched to other modes. The argument is not about whether walking or cycling will disappear entirely; just about whether the number of trips made in these ways would be eroded by talking about danger. PM: I don’t think he’s saying that people aren’t put off walking by perceived danger (although clearly, lots of people still walk) merely that virtually no-one sensible would argue campaigning for pedestrian safety *in and of itself* “dangerizes” walking – whereas prominent cycle campaigners like Copenhagenize are making this type argument against safety-orientated cycle campaigns like the “die-in”. Yeah, I think I am slightly missing the point above! Addressing the point, then…Maybe the issue is that pedestrians are already resigned to the fact that there’s a level of danger imposed on them… and those who can’t cope with that danger have simply surrendered and modified their behaviour accordingly so as to retreat to the safer routes (or other modes of travel). They’ve traded convienience for safety. Those who still cross, or walk along, the scary roads aren’t going to be affected by hearing about the risks becuase they’ve already decided to face them. 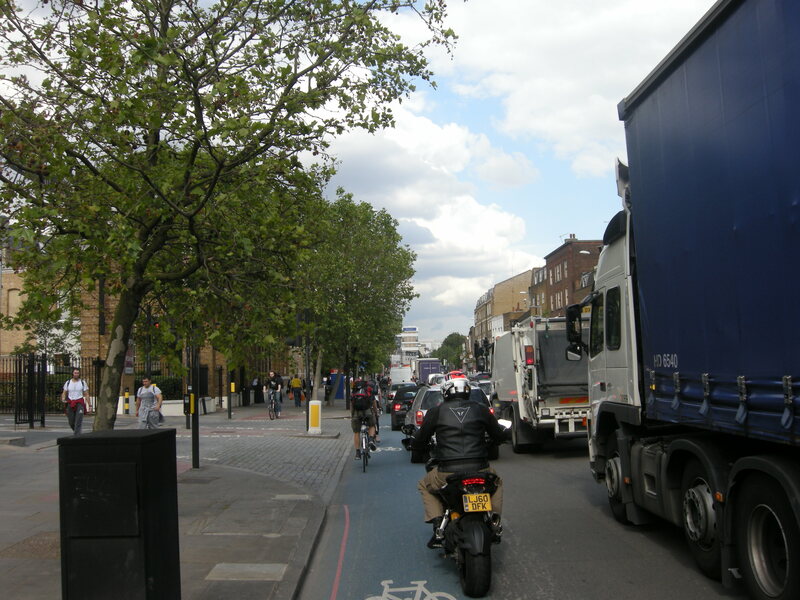 The complaints about ‘dangerising’ cycling then, presumably are founded on the notion that with cyclists there’s a third group – those who are on the brink of cycling but would be deterred by an emphasis on the dangers from cycle campaigners. I don’t know that I agree this group exists in significant numbers. Rather, because there are so _few_ ‘safe routes’ for cyclists, as the article here basically says, the reality is there’s barely even an equivalent of the first group, for cyclists (unless you count those who just go round the park occasionally). With cycling, most people are either already of the view that its too dangerous and so don’t do it at all, or they’ve already decided to face the percieved risk. I think that the key point is that pedestrians usually have some sort of refuge from motor traffic – and get very tetchy if it is invaded. Cyclists only rarely have that security. This is not an argument for allowing cycling on the footway but for decent protected cycle facilities to be provided with the same priority as providing a footway. I disagree on both points about dangerising. 1. Dangerising cycling is, in my view, a problem. It is quite possible to oppose road danger (danger from motorised vehicular traffic) and resent dangerising cycling. (A secondary but not that minor point is the transitive/intransitive confusion – cyclists don’t threaten other people’s safety that much). Without going into the whole argument, stressing the hazards of cycling slots neatly into the victim-blaming rubbish we have been seeing in London recently: cycling is “dangerous” so you should wear hi-viz, helmets etc. 2. Why is there no concern about dangerising walking? There is not much of a pedestrians’ rights movement in the UK, particularly since the Pedestrians Association was morphed into the relatively toothless Living Streets. Take, for example, the current “This Way for A&E” campaign (I have posted on this on the Road Danger Reduction Forum website). This basically engages in victim-blaming pedestrians and stresses the supposed dangers of crossing the road anywhere other than a formal crossing. (You will go to A&E if you don’t). There has been no protest against this – many members of Living Streets don’t object to it. A lot of walking, particularly by children and in some areas (like country roads) IS inhibited by fear. Sometimes people concerned for pedestrians rights carry on walking and take what steps they can to reduce danger. But often they go with the danger, and accept the view that basically they shouldn’t be out there (or should be told to cross/walk elsewhere, or wear hi-viz etc.). They don’t have the commitment towards pedestrians’ rights – apart from complaining about cyclists on the pavement – that some of us do about cycling. So they won’t complain about dangerising. They are OK with the solutions put forward by the “road safety” establishment. I sort-of see where the complaints about ‘dangerising’ are coming from, but I just don’t agree with them. I think they greatly over-estimate how much non-cyclists are influenced by cycle-safety campaigns and hugely underestimate how much people simply directly percieve the roads to be dangerous, from their own immediate experience of them. Your point about the ambigious meaning of ‘dangerous’, is an important one – in reality its driving that is ‘dangerous’, but unfortunately the English language seems almost to be designed to create confusion, by using the same word for ‘imposes danger on others’ and ‘involves others imposing danger on you’. Also, I’m thinking maybe the main difference is that pedestrians as a group have simply massively lowered their expectations and surrendered en masse, in a way that many cyclists have not (yet). Looking at this another way, sometimes I walk in the road if the pavement is too narrow. People I am with often point out that it is dangerous, but it seems to me that I am only where I would be if I was on a bike and in that case it would be perfectly reasonable to expect drivers to avoid me. So why should I be any different on foot? Brilliant post. Thank you and David Arditti again. Hopefully the more constructive discussion there is, the more action will actually happen, we can hope! I think it’s misleading to only distinguish between pedestrians, cyclists and motorists. You can just as well distinguish between considerate co-operative people and inconsiderate aggressive people. While the damage that can be done by the latter will increase as the mode of transport becomes faster and more powerful, I see little difference in mindset between aggressive motorists and aggressive cyclists (and even aggressive pedestrians who barge you out of their way), who have in common a tendency to self-righteous posturing when someone else complains about their behaviour. A courteous pedestrian being barged by a aggressive pedestrian is unlikely to result in serious injury or death – the same could not be said if the latter party was driving an HGV at the time. Frankly, “the damage that can be done by the latter will increase as the mode of transport becomes faster and more powerful” is somewhat of an understatement; I’d be less hasty to dismiss this supremely important distinction. Really, it amounts to yet more false equivalence (“both sides are as bad as each other!”) which drives the victim-blaming agenda. I really can’t figure out what point you are making. You are of course correct that some people are just reckless/aggressive and doubtless that will always be the case in this imperfect world. Which is why I think its delusional to imagine we’ll ever reach a point where all cyclists are perfectly well-behaved, and why its daft to suggest, as so many do, that cyclists can’t ask for better infrastructure till we reach that blissful state. But as Joel C says, the vastly differing potential for damage is a critical point. Human beings are a flawed bunch, so it seems to me we need to aim for a phyiscal environment that will reduce the damage they can do to each other. Strongly agree especially the last paragraph. A quick reply to pm’s last but one post: I’m glad you agree with something (as in second para about the ambiguity of the meaning of the word of “danger”) and also in the last paragraph about how pedestrians seem to have given up on their rights. And at least you “sort-of” see what we are talking about re-dangerising. I don’t think we overestimate the effects of “road safety” ideology as manifested in publicity and campaigns of one kind or another. They create a mindset where motoring is the default mode and cycling is a problem. You are told from a young age that “the road” is dangerous, rather than what motorists get up to. You are not told about the rights of cyclists and pedestrians in any definite sense. In addition, “road safety” campaigning pushing the whole hi-viz and helmets bit has a definite effect. All of that has to have a significant effect. I also dislike the emphasis on high-viz and helmets and the like. Not sure if its for the same reason. Its less because I think it makes cycling appear dangerous as because I just dislike, for moral reasons, the relentless emphasis on putting the burden of reducing danger on those subject to it rather than on those that cause it. But I still think the _only_ way of getting more people cycling is to make it objectively safer and less stressful. No matter how much one tries to avoid ‘dangerising’ it by not drawing attention to the deaths, the vast majority of ‘normal people’ will continue to see cycling as only for the ‘brave’. I think where I differ is I am just not convinced that there _are_ that many potential cyclists, given current conditions, who stand to be put-off by things like the die-in protest. In a London context, cycling plainly isn’t as safe as walking. Look at any road you can think of, ask: “Would I walk along here with an 8 year old?”, “Would I cycle along here with an 8 year old?”, “Would other people think it was a good idea to do so?” etc..
Boris is right about one thing. Cycling in London indeed largely is “Fine if you keep your wits about you”. But this means it’s only accessible to those who are both capable of doing so continually and prepared to, knowing that the consequences of getting it wrong are dire. This is not something expected of any other major mode of transport in the city – even drivers are, as far as possible, insulated from the consequences of mistakes (the same is not true of motorways, mind you – from a subjective safety point of view, I find cycling in London pretty comparable to driving on a busy, free-flowing motorway); children and other groups with less capability for attention & quick reaction of course travel as passive passengers, with the attendant consequences for obesity & loss of independence. Could you or I travel safely on the Tube if the carriages were built without any walls, completely open to the elements? Clearly yes – stay in the safe areas, hold on tight, don’t do anything silly & you’ll be fine – and if it were the most efficient of getting to work, many would doubtless choose to do so. But would people use it for day trips with the family? Probably only a hardy few – why put your kids in that situation if there’s an alternative? How would people react every time some poor soul met a grim end – even if as a result of actions that might be called inattentive or worse? The regular travellers would be immediately upset, and make demands that TfL put some walls on the carriages before anyone else gets killed. ‘Dangerisation’ is not a new tool. I recall it being used by the UK cycle activist establishment 15 years ago as a means of arguing against cycle tracks and to counter those of us who argued that cycle tracks were need to reduce the danger of cycling on the roads. Now it’s some of the same people using the same argument to slag off the organisers and participants in the brilliant ‘die-in’. Dangerisation is just a rhetorical trick using moral blackmail (‘you are putting people off cycling’). Those inclined to use such tricks should be treated with compassion as they are only showing signs of desperation as they subconsciously realise that they are losing the argument. Great that you’re comparing walking and cycling safety, because I truely believe this way of thinking is the the way forward if the UK really wants to create a cycling environment where everyone feels safe.